A round up of some important Family Law matters that have made the press. There have been many big stories in the press over the past few months of issues surrounding the family law sector. Some stories have been law defining. Others, whilst not necessarily law defining, have brought to light key questions that have split the nation. Fighting for life turned to fighting in the Courts- a legal battle that gripped the nation. The heart-breaking case of Charlie Gard came to a close as the parent’s brave battle through the Courts had come to an end. Charlie, born 4 August 2016, had a rare genetic condition called encephalomyopathic mitochondrial DNA depletion syndrome (MDDS). It meant that shortly after birth, his health deteriorated rapidly. Great Ormond Street Hospital (GOSH) said “the moment Charlie was diagnosed, his prognosis was bleak”. Following the traumatic decline in Charlie’s health, his parents naturally wanted to act. Connie Yates and Chris Gard (Charlie’s parents) wanted Charlie to undergo experimental treatment called nucleoside bypass therapy (NBT). At the time, it was not available to Charlie in the UK, so not wanting to give up the fight for his life, Charlie’s parents where wanting to transfer to US facilities. After talks with a hospital in the US, it was agreed that Charlie would be able to undergo the treatment. Even though the treatment has a very slim chance of success, Charlie’s parents where able to raise £1.3 million in funds to take him the US and receive the treatment. GOSH ruled out the treatment and so the legal scene was set. Following several pleas and attempts to the court (see timeline below) the legal battle had ended and Charlie’s fate was sealed. The case proved to be very divisive one. Should the parents have ultimate control over the fate of their child? Or, should medical professionals be in the driving seat and be able to ignore the request of a parent? Families where split around the dinner table and it provided for some much fuelled debate and conversation. But that’s all, just conversation. Charlie’s case had not provided for any law to be changed, modified or amended. For several months the case had grabbed headline attention in most major international press publications and we have even seen the Pope comment on the story. However, this was not due to the court giving unprecedented judgments, but quite the opposite. Many seemed to be looking for a review in the legislation around the subject of parental responsibility. But, key discussions and debates that took place on a global level, are still yet to influence UK law. Although Charlie’s case was a defining moment in our hearts- it was not in the eyes of the law. A modern view of family finance. Could this be the biggest divorce case that London has ever seen? Well, according to reports, Chelsea FC’s owner Roman Abramovich and his split from his third wife, Dasha Zukova, could be. A 50/50 split of assets is often presumed by the public to be the traditional split of finances following a divorce of a couple. “This of course is nonsense”, according to Simon Bruce when writing form the Solicitors Journal. Bruce goes on to explain that most cases are decided by need and not equal division. It is the needs of the families that is the “beginning and ending of a case”. Further to this, he comments that the wealth in a marriage exceeds the family’s need in only a minority of cases. The year 200 marked the turn of the century and was the year that Bruce felt brought English Divorce Law up to date with the rest of the world. The case of White abolished financial discrimination between wife and husband in the traditional sense- making reference to the roles of “bread-maker and bread-winner”. The case of White and the following combined cases of Miller and McFarlane in 2006 are said to be have the aim of promoting “fairness”. Such fairness as to the outcome of a divorce case, is determined by adding emphasis on compensation, equal sharing and by reference to needs. However, Bruce also comments that “the criterion of compensation (mostly, to date, of wives who gave up their careers to look after a family) has been…shamefully neglected and is over-ripe for correction”. It is said that the best guide to the sharing of assets has just been provided by Lord Justice McFarlane in the case of Sharp. Bruce lays out the lessons that we can learn from Sharp; the main one being that there is “no invariable rule of 50/50 splits in divorce cases. It all depends”. Read Simon Bruce’s full article and opinion piece, written for the Solicitors Journal, here. On the similar topic, Alec Samuels’ overview of the principal issues to be considered in maintenance cases, also mentions the equality principle. Samuels shares the statutory factors to be considered in maintenance cases from section 25 of the Matrimonial Causes Act 1973, in his article: Is the ex-wife expected to work? The quote has been widely reported on by the majority of Family Law news outlets. The source of the quote: Sir James Munby, who stated that he and society would have “blood on our hands” if proper provisions where no made for a suicidal teenager. He urged the state to protect other young women with similar needs. Munby was speaking out in his judgement in Re X (A Child)(No.3)(2017) EWHC 2035 (Fam) where he explains that the girl named only as X, has made many “determined attempts” on her own life. He called on the State to provide the 17 year old girl (X) with a “supportive and safe placement” upon her release from youth custody, Matthew Rogers reports. Further to that, in Munby’s judgement on the 3rd August, he admitted his “shame and embarrassment”, that he could not do more for her as the head of family justice. In a further ruling on 7th August, Munby commented that NHS England’s actions wouldn’t have been as “effective” or ”speedy” without his intervention. His ruling approved an order for X to be relocated into a secure unit on the 9th August where she will receive a bespoke package of care. Read The Guardians’ full article, here. Family Procedure Rules amended as of 7/08/2017. The Family Procedure Rules 2010 (“the FPR 2010”) are amended by the Family Procedure (Amendment No 2) Rules 2017, reports Family New Week. A new form D8 for application for divorce, dissolution or judicial separation is also available from 7 August 2017. From that date until 4 September 2017 the new or existing form may be used. After 4 September the new form only must be used. Read more details of the amendments, here. 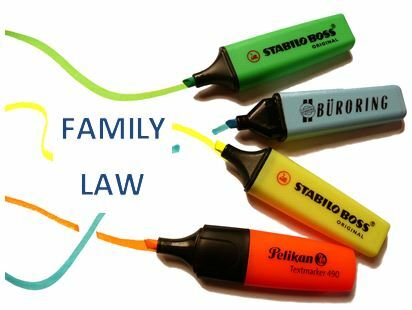 Want to keep up with the latest developments in Family Law and hear them first? Follow us on Twitter and our social media pages. If you need legal help involving a Family Law issue, contact WTB and our dedicated Family Law team. Ring us on 0161 244 3311 today.